Our house is covered in snails. We live next to a community garden, which is nice when it starts blooming, and also because at this time of year the wildlife is alive and well! Spirals in the snails and their hair! 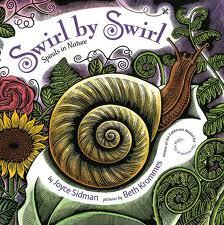 The rhythmic text of Swirl by Swirl takes us through spiral shapes in nature from the tiniest leaves and animals up to giant tornadoes and even the galaxy without going beyond a kindergartener's level of understanding. Sidman was a Newberry Honor winner last year and her talent shines through on each page of this picture book. The information is available, but never overwhelming, and the glossary in the back supplements the information provided for the child who wants more in-depth information about the concepts covered. Caldecott-winning illustrator Beth Krommes does an amazing job of capturing the rich vibrant layers of nature, through her use of both texture and colour. These lush creations are not easily forgettable, as my kids bring them up on our walks even through bamboo forests. It's hard to pick favourites in this book, all the spirals are interesting, but my daughter absolutely loves the curling elephant trunks. I reviewed this book for Nonfiction Monday, hosted this week by Simply Science. Thank you for participating in Nonfiction Monday. I loved this book, too. Oh how cool. I love that they were able to make a personal connection with the subject. I've seen this book around quite a bit but have yet to read it. That little photo of your kids and the snail is wonderful. Ok- I've gotta put that book on my library list!